Queen Máxima's putting together some interesting outfits during her current trip to Pakistan, which is a part of her work in inclusive finance for the UN. She's meeting all relevant modesty criteria while still staying firmly in her own wheelhouse; in this case, a house of statement prints and statement jewelry. Turquoise earrings and a ring caught my eye straight away. Any big turquoise pieces are bound to do just that, but matching these to the colors in her skirt was an A+ choice. Also: that skirt! 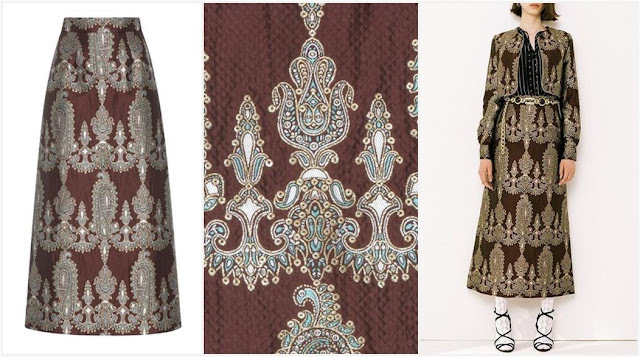 Add this paisley quilted skirt from Alessandra Rich (per ModeKoninginMaxima) to the list of things I wouldn't have thought would work as well as they do in action. The longer length works with her height (and her location and task, in this case) and that print is giving the whole thing life. And, let's be honest, I'd love it for introducing turquoise into the outfit even without other reasons. For more on Máxima's trip: See this gallery of her arrival and this brown/turquoise appearance, and here for day 2.